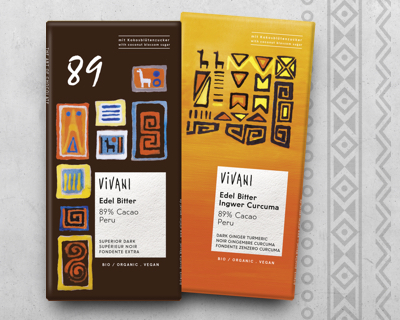 “Fine flavour cocoa” chocolate with a content of 89 % Peruvian cocoa. Sweetened with finest coconut blossom sugar. 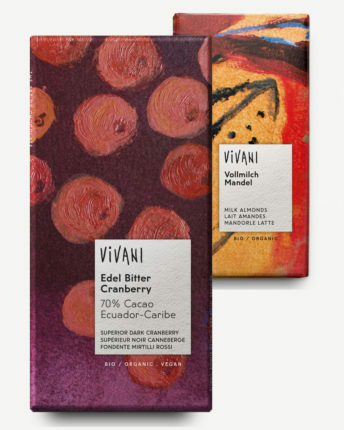 80 g.
Peruvian chocolate with a content of 89 % cocoa. Refined with spicy pieces of ginger and finest turmeric powder. A modern interpretation of the cult drink of the Aztecs. Bitter chocolate rasps with a spicy touch of chilli and cinnamon. Refined with coconut blossom sugar. 280 g.
Fine bitter chocolate rasps that can be ideally dissolved in milk or plant drink. 280 g.
Our coating chocolates look different now! We recently refreshed the packaging. 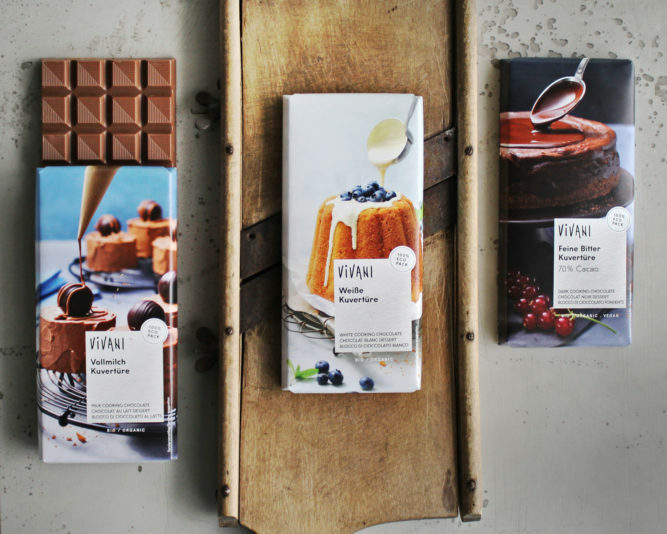 The results are pleasurable pictures, which make a lot of desire for chocolate bakery. 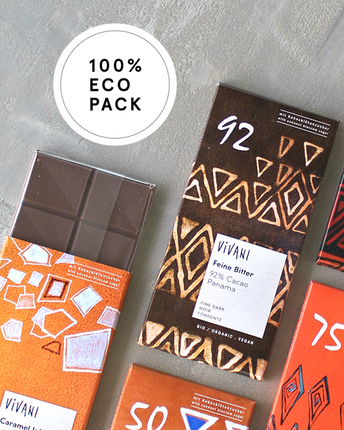 In addition, the coating chocolates now are also 100% organically wrapped, thanks to a compostable inner foil. Now available at your wholesaler. 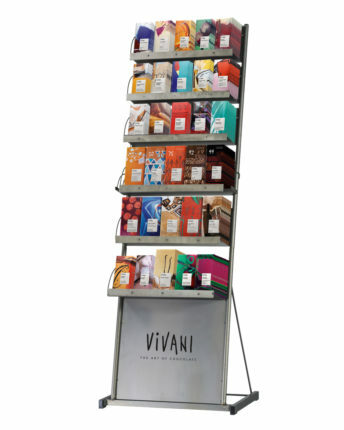 As a space-saving “all-in-one” solution, our VIVANI floor stand sets colorful accents at the POS. 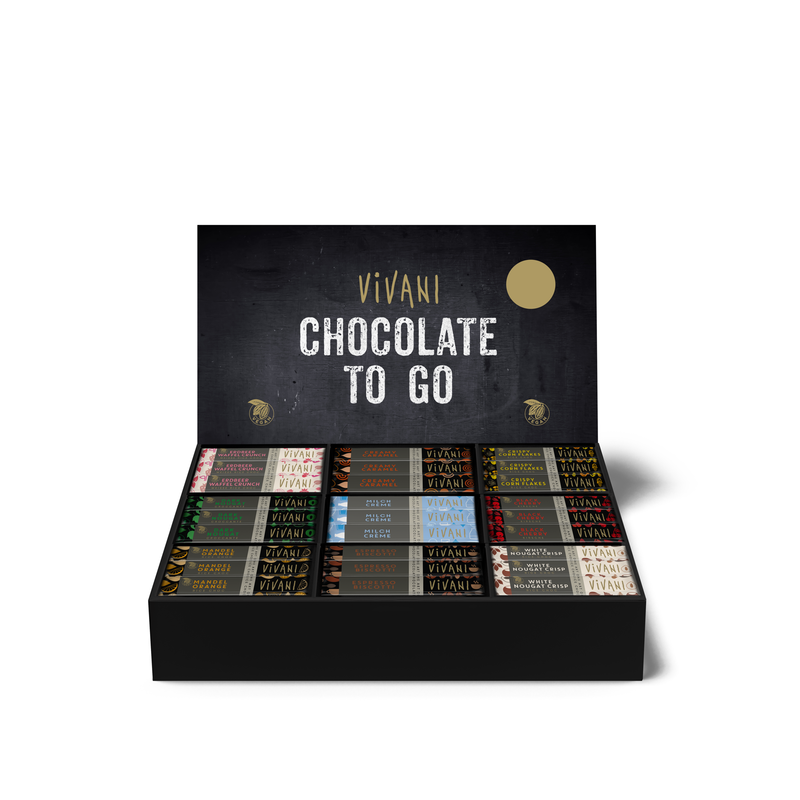 The sturdy display is made of stainless steel and can accommodate 30 types of VIVANI chocolate flavours (in total 304 bars). 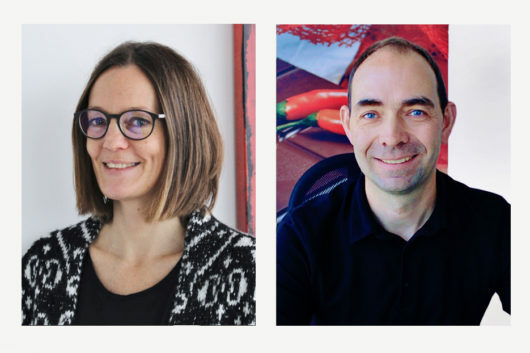 Your customers will surely find their favourites. 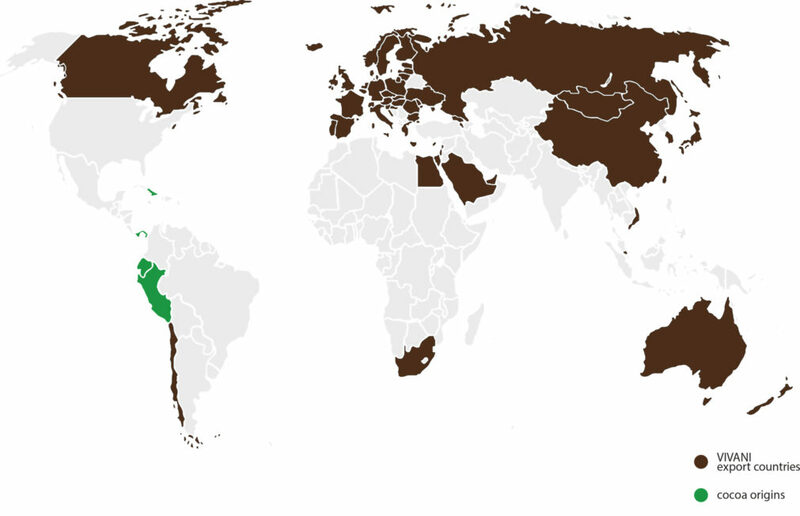 Variety of chocolate in the smallest space. 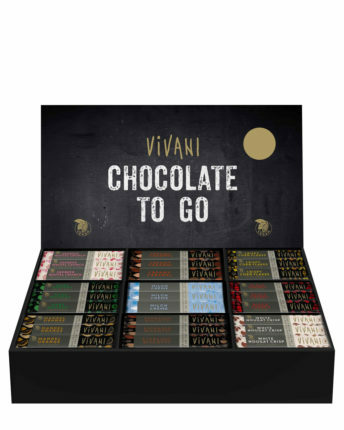 Its slim design allows 9 different types of VIVANI (10 bars each) to be elegantly placed on the counter. Perfect for the cash register area. 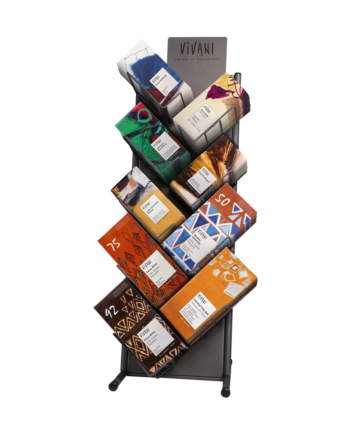 This solid cardboard display accommodates all 9 VIVANI chocolate snack bar varieties (in total 153 bars). The snack solution at the POS. It's not plastic - but sustainable! Yes, it is true! 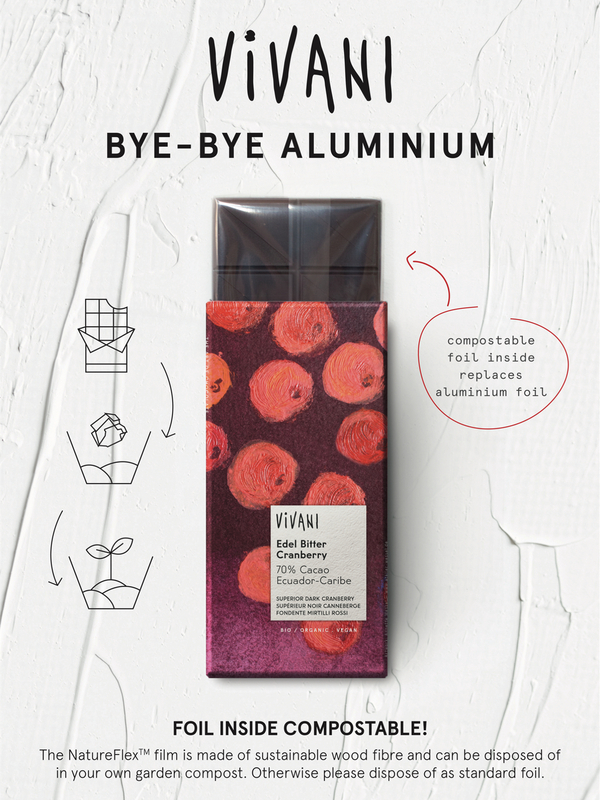 The inner wrapping foil of our chocolates looks exactly like plastic, but in fact is a sustainable foil made on the basis of wood fibre. It is even fully compostable! 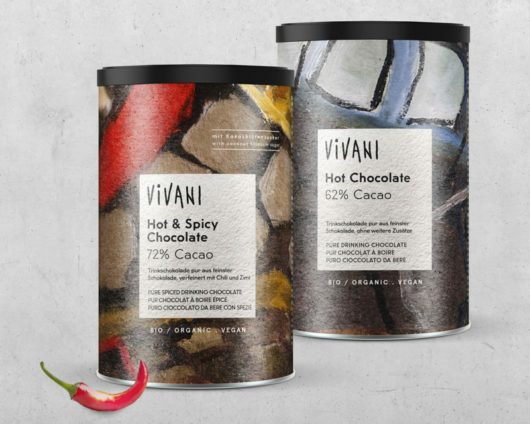 You need VIVANI product images for your online shop or other advertising measures? In our download center you will always find the most recent packshots in png-format. 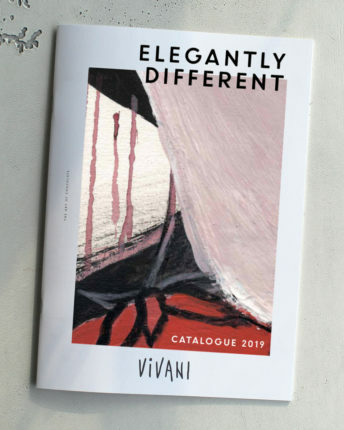 Stay up to date and download our current catalog in PDF format. File size 4.6 MB.